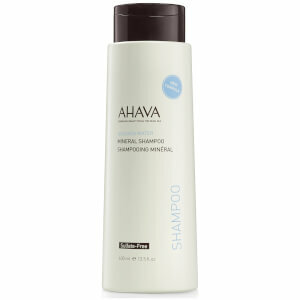 Restore radiant, healthy-looking locks with AHAVA Mineral Shampoo; a daily formula that works to cleanse, hydrate and soften strands from root to tip. Infused with a host of beneficial ingredients, including Aloe Vera, Chamomile and Osmoter™ (the brand's proprietary blend of Dead Sea Minerals), the shampoo gently eliminates impurities, whilst enhancing shine and silkiness without weighing hair down. Expect rejuvenated and refreshed locks that feel clean and cared for. Recommended for normal hair types. Apply to wet hair and lather. Rinse off thoroughly. Follow with conditioner. Aqua (Mineral Spring Water), Disodium Laureth Sulfosuccinate, Sodium Lauryl Sulfoacetate, Cocamidopropyl Betaine, Polyquaternium-7, Sodium Methyl 2-Sulfolaurate, Disodium 2-Sulfolaurate, Glycerin, Decyl Glucoside, Parfum (Fragrance), Phenoxyethanol, Lauryl Glucoside, Sodium Cocoamphoacetate, Sodium Lauroyl Sarcosinate, Sodium Methyl Cocoyl Taurate, Aloe Barbadensis Leaf Juice, Maris Aqua (Dead Sea Water), C12-13 Alkyl Lactate, Ethylhexylglycerin, CI 77891, Mica.